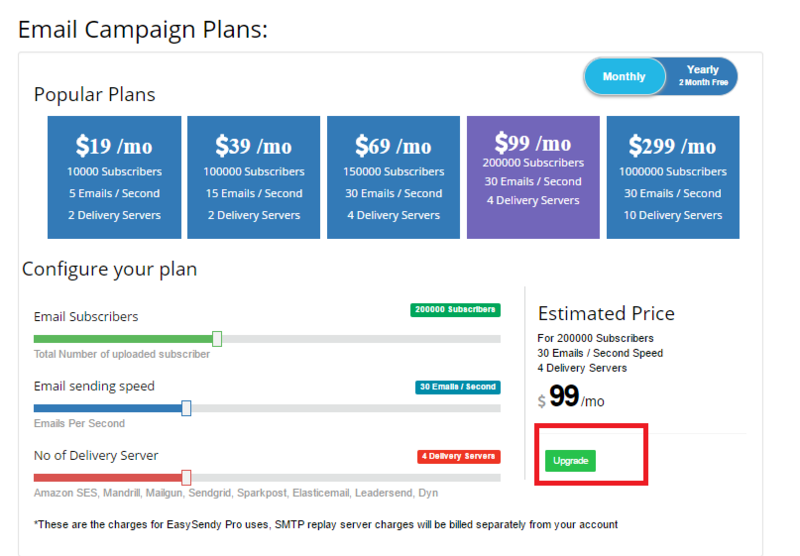 1.For this go to Price Plans from left menu of EasySendy Drip (or EasySendy Pro) Dashboard. 2. After that choose/ configure the new plan according to your new need to which you want to upgrade and click on “Upgarde”/ “Purchase” button. 3. Select the payment method Bank Transfer – NEFT / Wire transfer , “processed to payment”. 4. After successful payment; your account will be upgraded. According to the method you have used, it may take upto 7-10 working days for the wire transfer to complete into company bank account. For wire transfers it may take 3-10 working days and for NEFT transfer from India it may take 2-5 working days for payment to reflect in company bank account. As soon as we receive confirmation from our company finance team about the successful payment; your account will be upgraded to paid subscriptions.